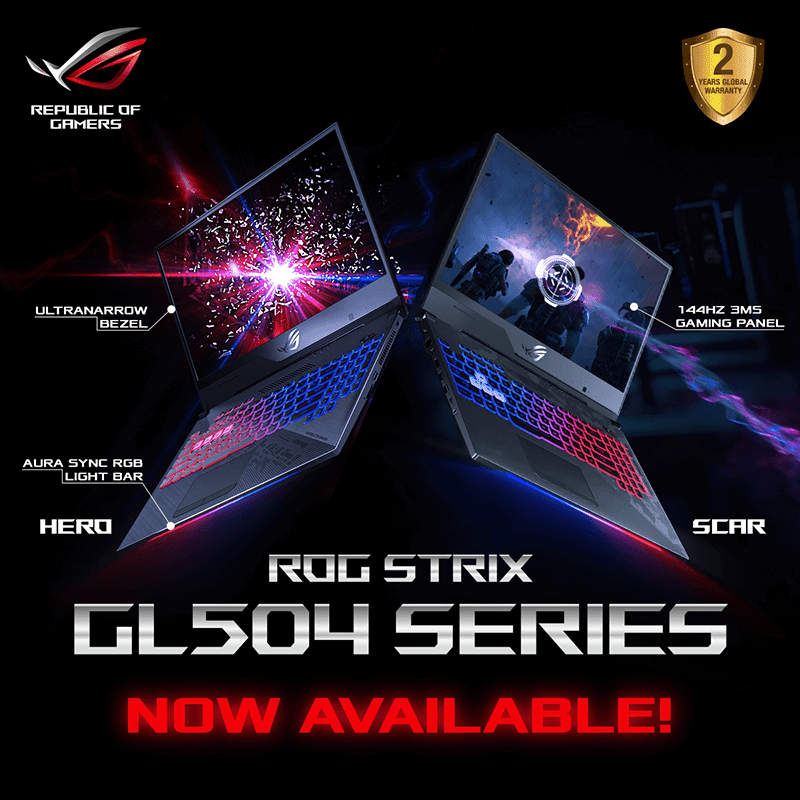 ASUS Republic of Gamers announced that their new ROG Strix GL504 series of laptops are now available in the Philippines. These are the SCAR II and Hero II. These are the updated follow-ups to the e-Sports-oriented gaming laptops. They arrived with more compact design and a new RGB light bar out front that can be customized via Aura Sync lighting. The SCAR-II and Hero II will be the first laptops that are going to feature a 144Hz ultra-narrow bezel display which allows for both immersive visuals as well as responsive. Inside, both laptops will be rocking an 8th Gen Intel Core i7-8750H processor and 16GB of DDR4 2666MHz RAM. The SCAR-II has 256GB NVMe PCIe SSD, a 2.5-inch Firecuda 1TB SSHD. and an NVIDIA GeForce GTX 1070 with 8GB of VRAM. The Hero II will come with a 128GB NVMe PCIe SSD, the same 1TB SSHD and an NVIDIA GeForce GTX 1060 with 6GB of VRAM. The Strix GL504 gaming laptops will be available at ROG Strongholds and ASUS authorized resellers nationwide. The SCAR-II will be priced at PHP 129,995 while the Hero II will be priced at PHP 104,995.